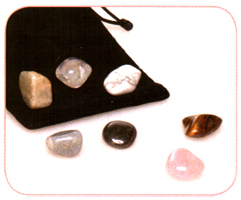 The ancient art of crystal healing uses the gentle transformation properties of stones and semi-precious stones. When stones are placed on specific points on the body, they support the process of dissolving stress, removing blockages and neutralizing negative energies by drawing energy away from over-stimulated areas and re-energizing a depleted one, thus inducing a feeling of well-being and harmony. A balance between the Chakras promotes health and a sense of well-being. Chakra imbalances affect both our physical or emotional bodies. The use of crystals and gemstones aids in the re-balancing of all the Chakra centers. Crystals and gemstones respond to the electricity that is coursing through our body, and if the energy is low, the constant electrical vibrations of the stones will help to harmonize, balance and stimulate these energies. Includes the basic stones needed to activate the chakras. 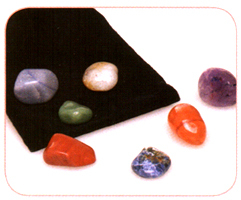 These beautiful semi-precious stones are placed on specific body points to unblock energies and release vitality. 7 stones with pouch and mini chart. This set of semi-precious stones balances the energies of the body. Intended to be used along with the Activating Chakra Set, but may also be used alone for Reiki treatments or hot stone massage. 7 stones with pouch and mini chart.